Why stay home this year and hide from ever present awful tinsel? Be your own Santa, fly away from holiday blues to a movie world: Morocco. Why Morocco? ***Small accessible country with one medieval scene following another. Ancient desert towns? Walled medinas? Roman outposts? Snow capped mountains? Tribal henna’s hands? ***Friendly to Westerners: see Sunday’s feature in the NYTimes about a woman visiting Fez solo. ***Access to a UNESCO Heritage church Christmas Eve. ***Wonderful hotels with pampering in the Turkish bath or the jewelry store. ***A group of enthusiastic friendly women to share it all with. Besides photos, record the harmonic sounds of the call to prayer at sunset. Even if you are shy, at least look into the hammans (turkish bath) in our hotels. Tuck in a folding suitcase and /or heavy tape in case you buy a carpet- so inexpensive. Boxes are easy to find tape less so. Love decorative objects? Make a crayon palette of your home and choose colors wisely . There is more to buy here than in any country you will ever visit. Royal Air Maroc is the national airline making it the pride of the country. Join us and begin your adventure right here in JFK. Most Mid Western and Eastern connections work with this schedule. Morocco, been three times. Love it. 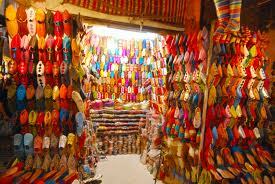 This is a babouche store: soft leather slippers, hundreds in every souk in every color. Bet you cannot resist buying at least one pair!